I know, I told this so many times before, but again, Starbucks took me by surprise. Could you imagine there will be new You Are Here Christmas Ornaments? And let me remind you, this is the first time Starbucks releases anything like that since 2014! 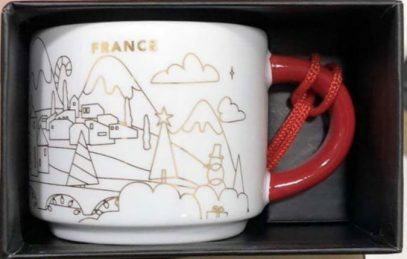 This particular mug is for France, and there is no regular Ornament we can compare it with. In fact, it is the copy of it’s bigger, recently released sibling, which in it’s turn resembles regular YAH France. There is one special thing I’ve forgot to mention earlier, this Series introduces new box – it’s not green or blue as we’re used to. In fact it is black! Similar to bigger mugs, I expect more Christmas ornaments this year, fingers crossed!